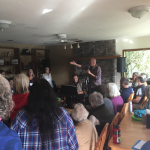 My heart is full of gratitude after the 1st Annual Songwest - Bamfield. 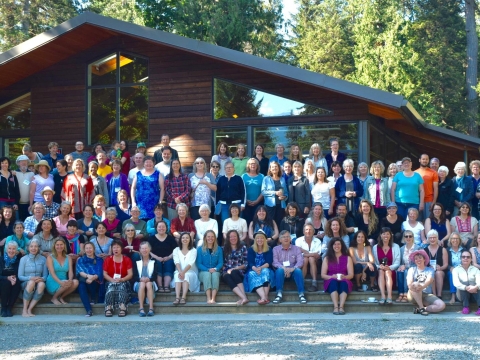 This incredible weekend was put together by Bamfield's own Nancy Hendry and it gathered 30 singers from Vancouver, Vancouver Island (East Coast!) 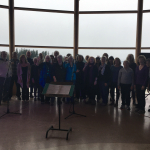 and Quadra Island plus 10 singers from Bamfield. We spent 4 days together - exploring the incredible surroundings and in classes with Jennifer Scott, Brian Tate, Michael Creber and me. 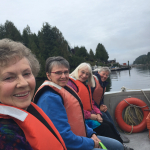 For most people, it was their first time visiting Bamfield and I know that we're all hoping to go back and continue to explore this beautiful place and get to know the people better. 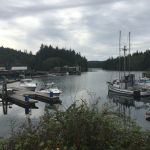 We arrived Friday morning very early and headed off on the 3.5 hour journey from Nanaimo through Port Alberni onto the gravel road heading into Bamfield. The bumpy road was quickly forgotten as we spilled out of the bus and onto our first stop - Pachena Beach! 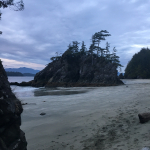 Pachena Beach is amazing - a long stretch of sandy beach, with scattered driftwood, rhythmic crashing waves and towering trees behind us. 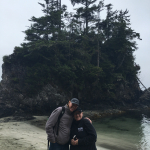 The fresh air, space and silence was a balm for us city folks...we walked the shore, looked at sea life, ate ourlunches, had time to chat with each other and even walk the first few steps of the famous West Coast Trail. We got back in the bus and drove into town for our first view! From there we were transported by a fleet of boats, across the bay to our home for the next few days. The lovely, friendly and warm McKay Bay lodge. We found our rooms, settled in and then got started with Mass Choir with Brian, Michael and I, a welcome wine and cheese, dinner and our 1st singing class. That was just Day One! Day Two - delicious breakfast all together in the lodge, vocal warm-up with Jennifer, Mass choir, Singing Class all before noon! After that we grabbed our bagged lunches and split up into groups to explore Bamfield for the afternoon. People walked the boardwalk, went to the Bamfield Marine Science Centre, went kayaking, visited Brady's beach, took boat rides and a large group of us went on a tour of Kiixin. I was lucky enough to get on this tour of Kiixin and will remember it forever. 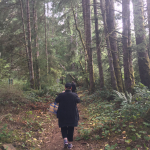 Kiixin - we were guided by Huu-ay-aht story teller and guide Whish-Kay. 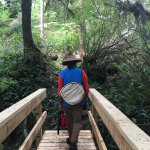 Just a short bus ride away, we were led on a rainforest hike - seeing the gorgeous, lush forest, learning about Culturally Modified Trees, how long the Huu-ay-aht have called this place home and some of their process of signing a modern treaty. After a 30 minute walk we ended up at the beach...the most beautiful beach. There Whish-Kay sang us a Canoe Song - talking of the importance for us to paddle together into the future. 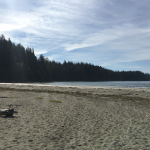 We explored the beach on our own for a while and then Whish-Kay lead us to the site of the ancient Huu-ay-aht village. We could see remnants of several homes - the giant corner beams, fallen supporting beams, the entrance to the chief's home. 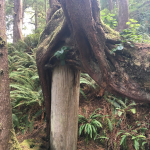 Whish-Kay was a beautiful storyteller who taught us so much about life in this village, the old ways of whale hunting, the beliefs of the Huu-ay-aht and the incredible history of resilient people who have lived there for over 5000 years. 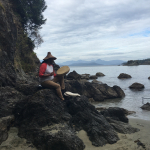 We came back out on the beach and we all sat down on a large pice of driftwood while Whish-Kay sat on the rocks and told us the amazing story of a battle in 1803 and the resilience and ingenuity that followed over the next 25 years. He also sang for us and the sharing of history and culture was mesmerizing and deeply moving. 2017 is the first year that they have offered these tours of Kiixin and they are absolutely wonderful. We hiked back through the rainforest, hopped on the bus, then on boats, then ran up to the lodge in time for our next singing class! Then we had another delicious meal and settled into our spots to watch Jennifer Scott and Michael Creber's famous singer's Masterclass - 8 brave souls got up and sang for us all and we watched Jen and Michael's skillful teachings and musicality transform wonderful performances into ones that were even more open, connected and heartfelt. Day 3 - this was our big singing day! Vocal warm-up, mass choir, both singing classes followed by rehearsal time for the concert and then...the concert! In a little down time - Jennifer, Brian and I got a ride in an ATV over to Brady's Beach where we wandered around the beautiful beach and even had a moment to practice an Italian trio! Classes were wonderful and students were fully in the swing of things by Sunday. The next adventure awaited us for our concert. We went down to the docks and were loaded into skiffs and sent down the bay to the beautiful Rix Centre. The student concert was absolutely beautiful. The Mass Choir performed, the faculty performed and many students performed songs they brought from before or songs they had been working on over the week. People from the community came out and I felt that by the end of event, that Songwest will be a recurring, popular and well-supported community event for years to come. Day 4 - sadly, we found ourselves on our last day in Bamfield...Some people had worked hard to maximize their time there and hadn't gone to bed until late in the morning the night before. We had breakfast and lavished praise on our wonderful cooks and servers for the weekend, packed up and headed into our last class. 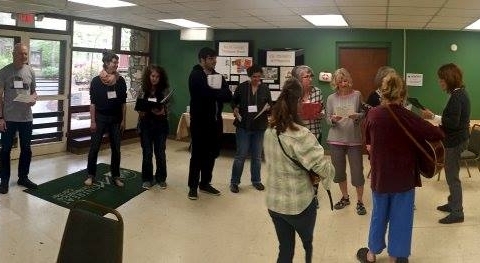 Over the weekend, students had been learning Blues singing, improv, African rhythms, solo masterclass, Appalachian harmony singing, South African choral , African American gospel, Mass choir and vocal warm-ups/technique and Qi Gong! 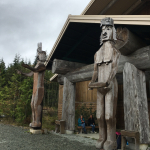 We wrapped up classes and headed out on the boats and made our way to the House of Huu-ay-aht to visit the Nation's Government building and their beautiful large hall. It was a professional day at school so several children were at the hall and they sang for us and we sang for them. A lovely exchange to cap off our first ever SongWest! In the government building we were shown art, photos and the treasure room where they displayed some of the repatriated art from the BC Museum. 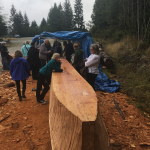 We also got to meet Hipolite Williams - a master carver/artist who is working on a new canoe. He took the time to show us his tools, explain his process and demonstrate how some of the carving happens. We headed onto the bus, ferry and eventually car and made our way home...hearts filled with music, community, friendship and many new learnings. Village Harmony goes to Cuba.